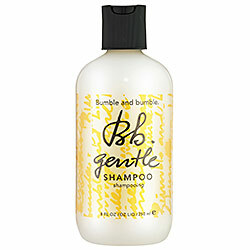 This is probably one of the first products that I ever bought from Bumble and Bumble. This one was suggested to me when I was on the hunt for a new shampoo. I like a shampoo that isn’t harsh but still leaves my hair feeling very fresh and clean (who doesn’t want that feeling?). This product is specifically designed to add shine to hair and is geared towards those with color treated hair in need of moisture. I purchased this 8 oz. bottle for $24.00. This was another one of those buys where I was really hoping for the amount of money I was spending that I liked the product. I was told that this shampoo was “gentle” enough to be used on a daily basis with0ut wreaking havoc on hair. I only wash my hair every other day so I figured even better! I was concerned that because this shampoo is a gentle shampoo that it maybe wouldn’t give my hair a good deep clean like a clarifying shampoo or other line of shampoo would do. I was pleasantly surprised though because it actually gave my hair a very good clean! I really like that this product is lightweight and after washing my hair with it, it’s left feeling fresh and clean. It has a creamy lathery consistency and I find that it doesn’t really have a prominent scent. The scent that it does have is very mild yet pleasant. Even with its gentle name, this shampoo gets the job done and I would feel safe washing my hair with it daily.